Unisex hoodies by AWDis with twin needle stitching detailing, double fabric hood with contrast inner, kangaroo pouch pocket with small hidden opening for earphone cord feed and hidden ear phone loops. DELIVERY/COLLECTION/COLOUR OPTIONS: To have this item delivered direct to you, just fill out your shipping address as normal. Should you wish to collect the item either from Welch Sports, Maylor St, Cork or at the next SFH camp, please use the discount code localcollection and state where you would like to collect your item in the "Notes or instructions" column during the checkout process. 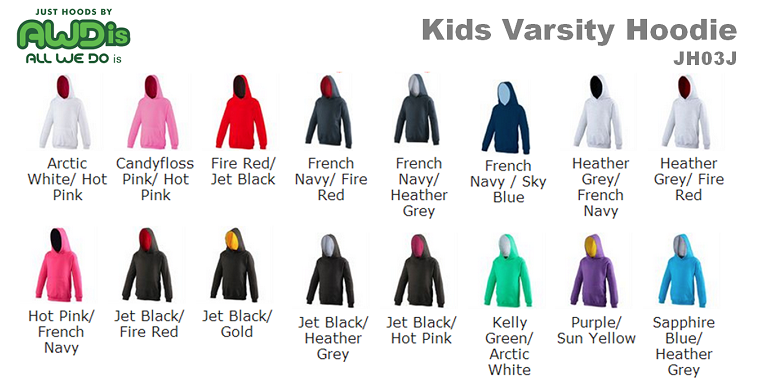 Don't forget to also let us know which colour combination you would like!